The excellent USB bus-powered Audiobox 96 USB audio and MIDI interface is a plug and play dream that is compatible with both Mac and Windows based operating systems. The sleek and compact design is as functional as it gets with 2 combo mic/instrument inputs with Class A mic preamplifiers and phantom power for condenser microphones, allowing you to record vocals or instruments with ease. The Audiobox 96 USB is capable of recording at 24-bit resolution with a 44.1/48 kHz sampling rate. Thankfully, Presonus have gone to great lengths to ensure zero-latency monitoring is a breeze via the internal analog mixer, allowing you to track what you're playing in real-time and with minimal fuss. The headphone jack has an individual level control, which allows you to adjust the signal volume. Included in the bundle is a computer-to-interface connection cable so you're good to go as soon as it arrives. The Audiobox 96 is a truly mobile interface so not only will it perform in the studio but it also makes for a great interface when out gigging. The headphone output delivers masses of volume so that you can hear your output audio as clear as day, even in noisy locations. The Audiobox 96 can also be powered directly from USB and will fit in your laptop bag. The Audiobox USB 96 was designed to work with any digital audio workstation that you use but it also comes bundled with a license for Presonus' own Studio One Artist giving you a complete digital recording and production suite right out of the box. In addition, the Audiobox 96 also comes with the much revered Studio Magic plug-in suite giving you some incredible tools to develop music including effects and virtual instruments. 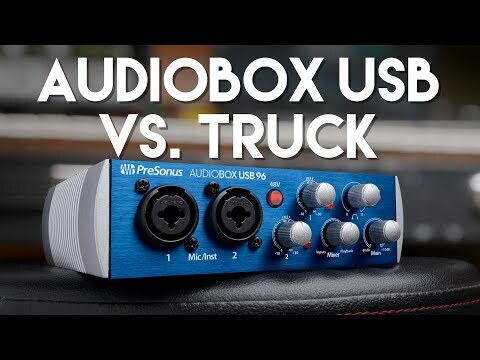 Presonus have won many awards throughout their illustrious career, and their Audiobox 96 has received the same attention-to-detail and careful construction that has gone into their flagship products. For form, functionality, ease of use and superb quality, this versatile little interface will deliver big results.